Property cooling measures in Singapore could be eased as early as the second half of 2016 if private home prices continue falling, revealed Donald Han, Managing Director of Chesterton Singapore, at a luncheon hosted by Credit Suisse for its Singapore investors. He believes a price drop of around 15 percent is likely to prompt an adjustment of current housing policies, given the small buffer before property owners slip into negative equity. The Urban Redevelopment Authority’s (URA) residential price index has recorded an eight percent slide from the peak in Q3 2013. As a result, property measures could be relaxed in 2H 2016, with rising interest rates acting as the “9th cooling measure”, shared Han. 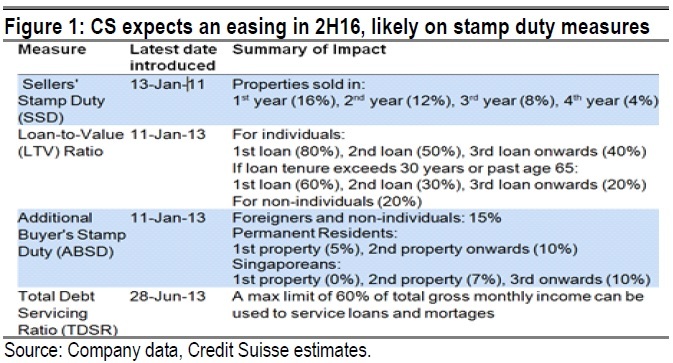 “A reduction in the ABSD (Additional Buyer’s Stamp Duty) is most likely, but a reduction in the SSD (Seller’s Stamp Duty) could also materialise, should there be higher instances of mortgagee sales. The TDSR (Total Debt Servicing Ratio) is unlikely to be removed, however. Meanwhile, mass market homes are expected to see the fastest erosion in prices as the bulk of private supply is within the Outside Central Region (OCR), said Han. In addition, he predicts the large supply of up to 20,000 HDB flats in 2016 will put further pressure on suburban home prices. This comes on the back of the “Bidadari” effect, where strong demand was seen in the November Build-To-Order (BTO) launch, which saw 5-room flats oversubscribed by 23 times. The Zurich-based firm has rated City Developments Limited (CDL) as its top pick among property developers, as “CDL is also best positioned for a turnaround in the Singapore residential market sentiment in 2016″. This entry was posted in Cooling Measures and tagged ABSD, additional buyer’s stamp duty, Cooling measures, Private Home Prices, property-cooling measures, seller's stamp duty, Singapore Private Residential Property, SSD, TDSR, Total Debt Servicing Ratio. Bookmark the permalink.